Scientists now know why jellyfish-like salps swimming together move better than a single salp pulsing solo. That information, says UO marine biologist Kelly Sutherland, could guide the development of jet-propelled underwater vehicles. Working at the Liquid Jungle Lab, a research station on a Pacific island off Panama, researchers used high-speed, high-resolution, underwater camera systems to study the propulsion of the elusive, hand-sized planktonic tunicates both underwater and in the lab. Salps are small barrel-shaped invertebrates that feed on plankton. They swim by producing a jet from a rear-facing siphon and refilling with water from a forward facing siphon. The same water that helps propel them forward also contains food particles that they collect on a feeding filter as the water passes through their mostly hollow bodies. Salps are found individually and in chains, or colonies, up to 15 feet long. They have a solitary life-stage that produces an interconnected colony. Sutherland has also studied the propulsion of siphonophores, another jelly species that is always colonial. Previous research on jellyfish propulsion focused mostly on how much thrust they produce, overlooking side effects of their periodic pulsing motion such as drag caused by acceleration and deceleration. Those limitations were addressed in the new study. Read coverage in The New York Times: It’s Better to Swim Alone, Yet Together, if You’re a Salp. 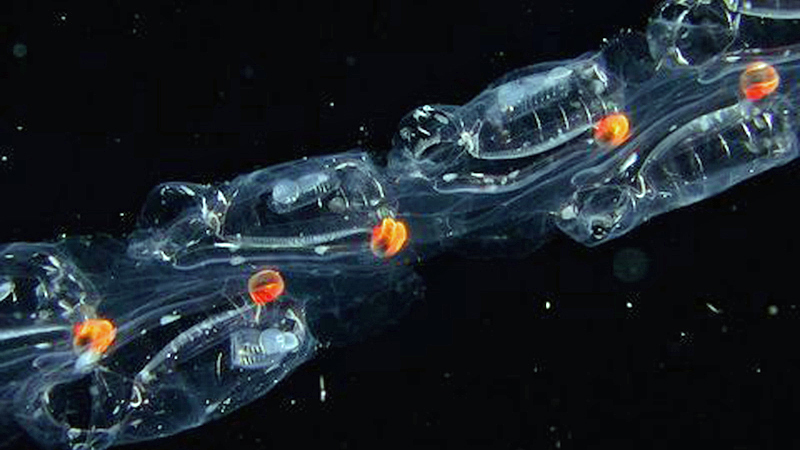 The new findings, which were published online Aug. 2 in the Royal Society’s journal Interface, detail how multiple, uncoordinated pulses produced as salps swim in a colony result in a smoother velocity profile than that attained individually. The paper was co-authored by Sutherland and Daniel Weihs of the Department of Aerospace Engineering and the Autonomous Systems Program of Technion, the Israel Institute of Technology. That, she said, explains why salps swimming in combination are able to migrate up to depths of 1,000 meters (3,280 feet) during the day and return to the surface at night. Understanding the propulsion systems of jellyfish, Sutherland said, could have engineering ramifications. The National Science Foundation and Sloan Foundation supported the research through grants to Sutherland. Weihs was supported by the LFN Fund. Additional videos are available on the journal's website.